Next year I might find myself needing a lightweight touring/camping shelter, suitable for overnight stops at camspites and at the roadside. One option is a single-hoop bivvy tent (example) but many of these aren't much lighter than my hiking tent, and they're rather expensive. A hoopless bivvy bag seems more like emergency kit to me (with the exception of the Salewa which allows the hood to be lifted with a cord to a branch, fence, or bike). My choice is rather restricted by my height -I'm too tall for many of them. We can a assume a decent weather forecast before setting out for a few days, so some need for rain-proofing (and face cover) but not planning to be out in a storm. 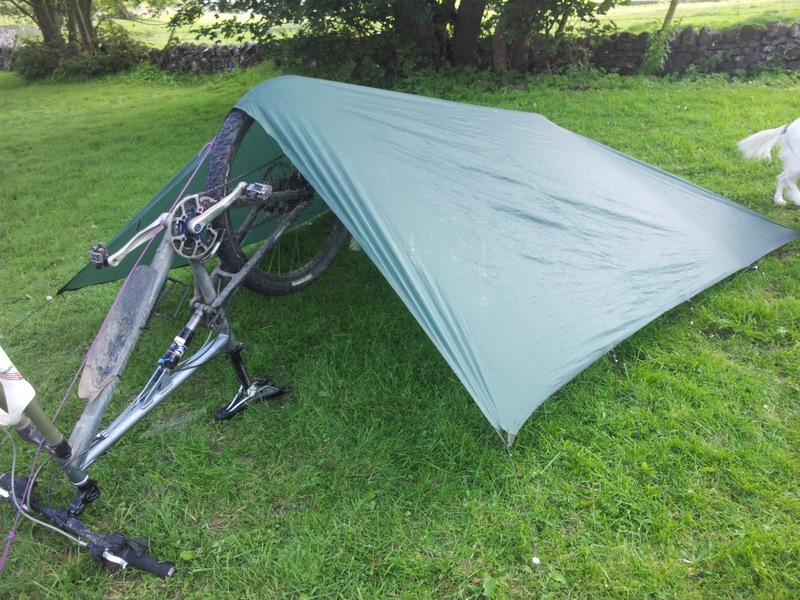 As an alternative I wondered about getting a tarp, and using the bike itself (held up with guy ropes and possibly a kickstand) to lift the head end. This would have the advantage of no poles to carry, making packing very easy. Has this been done before? Are there any plans in existence? I've got reasonable DIY/craft skills and equipment but not really for working on fabric beyond minor modifications. 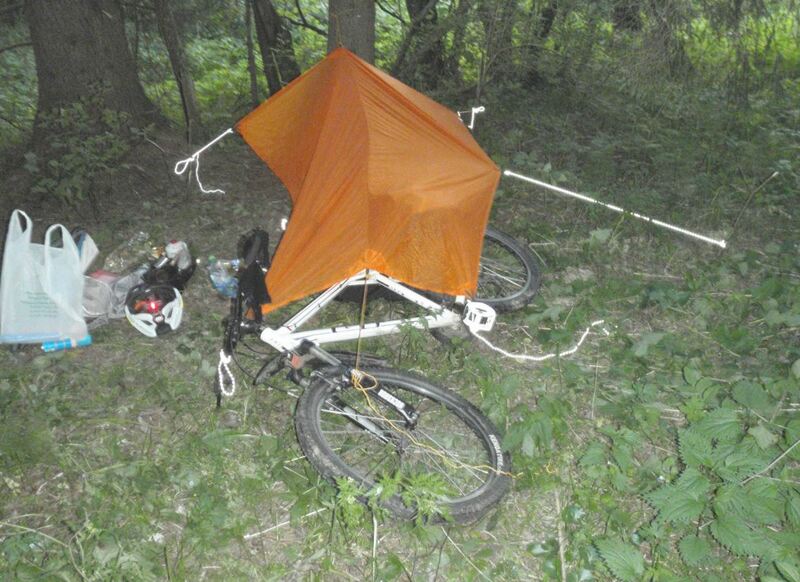 Get a tarp, and use your bike to provide at least three mounting points for it. Yes, its been done before, there are various configurations. 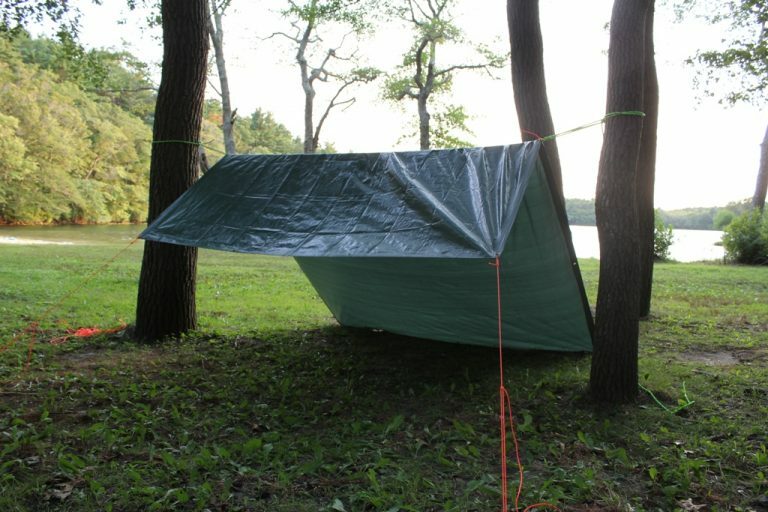 Google for 'Bikepacking tarp shelter' for many ideas. Good resources for this type of thing are bikepacking.net forums and in the UK Bear bones bikepacking. You don't mention where you will be riding so I have to use my own area as an example. 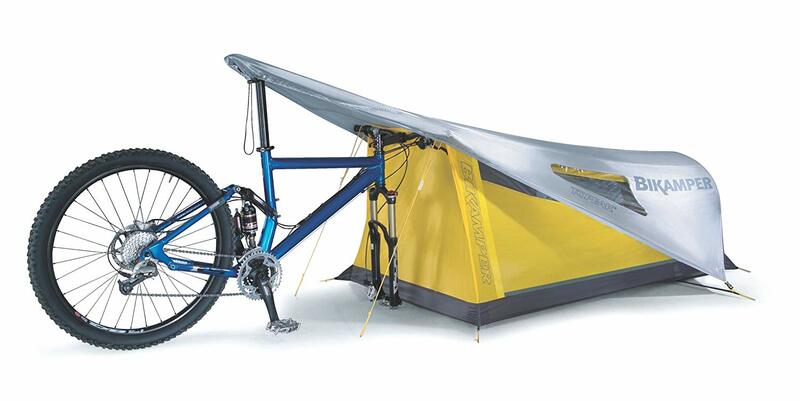 Using your bike as part of a tarp/tent rig is a horrible example. I know your trying to keep weight down, but even a simple tarp/lean-to is better than using your bike. This is opinion, but one of the few places to spend some extra weight is rest and food. 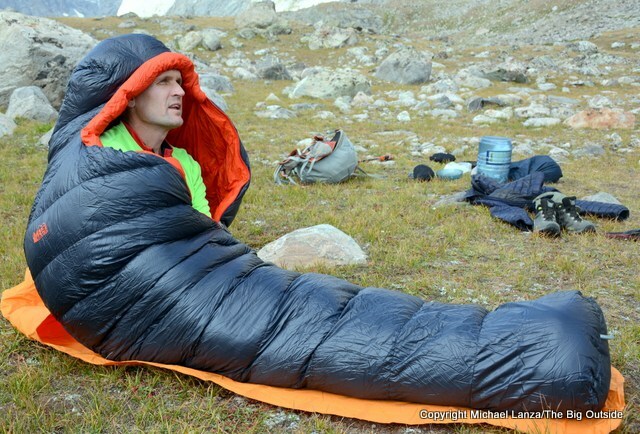 For example, a too lightweight stove setup that can't cook and gives you food poisoning (or limits your foods too much) is not going to help you complete your trip. Likewise, a good night sleep can make carrying that extra weight worth it. That said, you asked about lightweight solutions. All without using your bike, and while providing ample cover and space. Of course, it really depends on whats about. 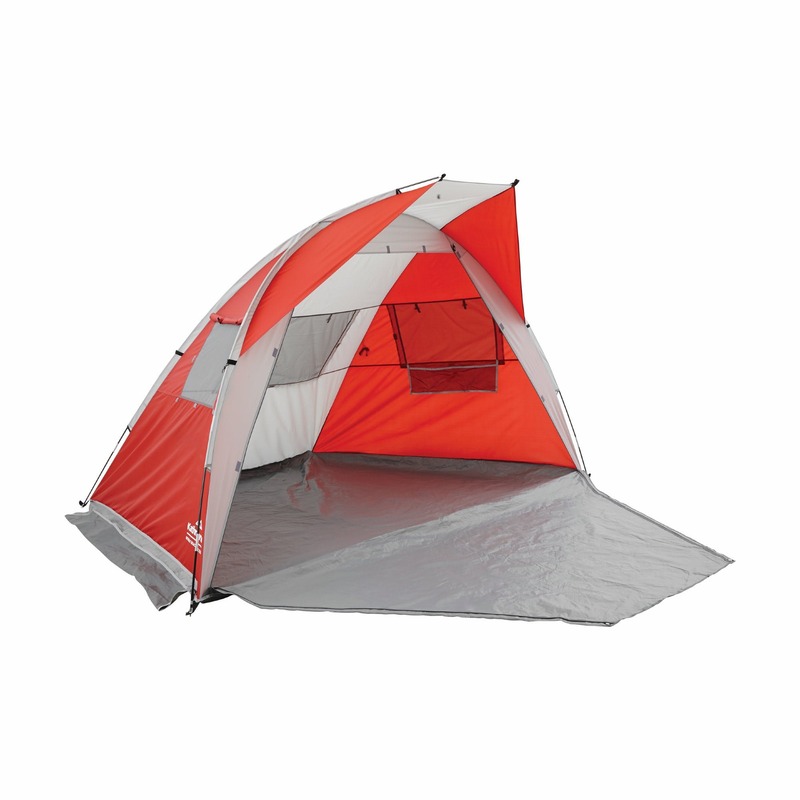 There are also a number of 1-2 person tents that come in under or close to the 2 lb mark. I have spent the occasional night outdoors in nothing more than a sleeping bag with a groundsheet between the bag and the damp ground. As long as you have something to break the wind and something keeping you off the ground, then you can get away with very little on a summers night. Bugs can be more of a problem than you might expect, so aim to have some netting to cover yourself. If the weather does break on you, it can get miserable quite quickly so you will still want to pack a waterproof jacket. I've often used my bike in combination with a tarp with a camo pattern as a shelter. Often I set the system up so that it starts compact: the tarp drawn close round the bike effectively concealing it--even among scant tracts of brush dappled with a few young trees. This allows more "pedestrian" activities such as hiking or supply gathering where a bike would limit your movement. 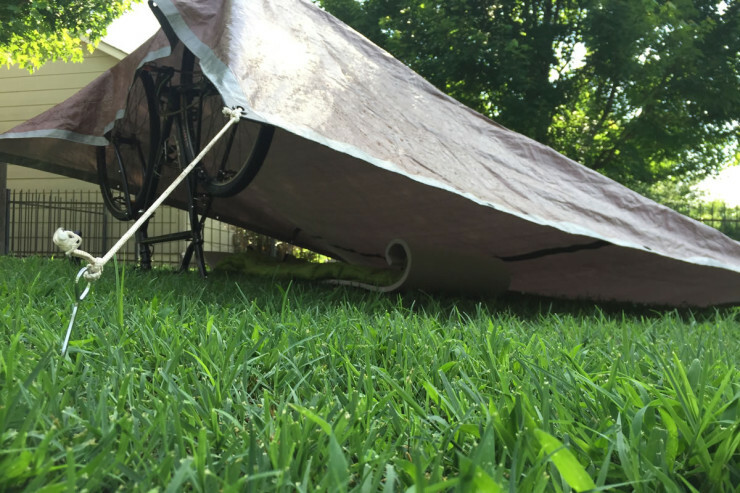 Upon return to the bike basecamp, two corners of the tarp are disengaged, the tarp is unfurled and the two ends secured (via tether, rocks, or staking) to predetermined points. Varying essentially the heighth, and less often the breadth, of these two points allows the shelter to be flexible from lean-to to straight over-head to lean-to the opposite way. Each of these steps creates increasing amounts sheltered volume because the one constant side is the profile of the bike that is partially enrolled by and secures the tarps opposing edge. It's not dissimilar to the third pic above. Except I typically keep my bike upright and that side of the tarp entirely around the bike. This set-up is good where true camping is discouraged or when attention to the bike or human activity is unwanted. I'm not promoting any shenanigans here...in fact where I come from, you'd likely come out better after a walk thru a bad part of any inner-city than if caught trespassing. Shelter and privacy, however, are necessary things. 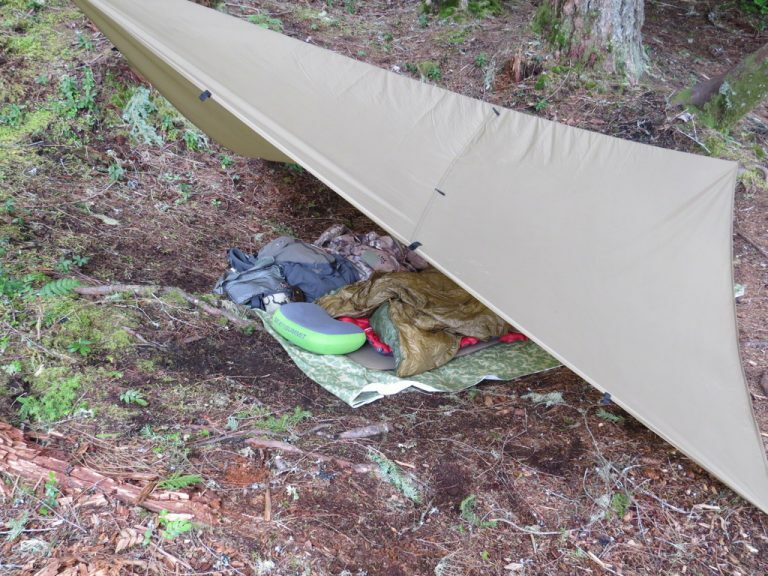 Couple of tid bits: To achieve a little more "standing room" find a linear depression --a narrow low run of ground within the woods, placing the tarp+bike side on one high side and secure the free ends on the opposite high side. Stand tall under the tarp in the low ground. Related to this, become virtually invisible by tarping over a low contour in the land. 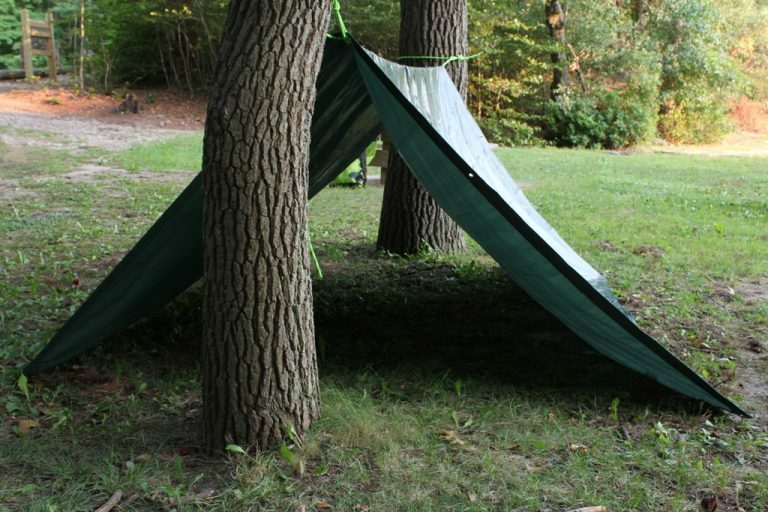 Under this you'll be sheltered and below the surrounding land's line of sight as if you'd disappeared over the horizon. Good technique for open land like prairies, pastures, deserts and such. Another advantage to this kind of laying low is that air temps are typically cooler in hot weather and warmer in cold temps. Its not big enough to lie in sideways, but you can keep your head and shoulders in there, along with your bags. It will also act as a wind break should the wind pick up overnight. Not the answer you're looking for? Browse other questions tagged touring equipment or ask your own question. Going on a long distance bike tour: what kit do I need? Is a Racing-Bike making creaking noises a sign of equipment damage? Can there be a stack exchange for casual, rural bike riding and remote touring free of the fanaticism of professional bike riders? What is the necessary equipment on longer bike rides? How do I calculate calories burnt using my bicycle's weight? What are the reasons for using a cradle with a handlebar mounted drybag?